So we made it through the mud. Bruised, sweaty and very, very dirty. But we were alive and proud to have made it. The mud part is certainly one of those stories you will tell your grandchildren. After the mud, the second part of the day should be easy. Or should it? Having burned all those calories lifting up the bikes when we crashed we were hungry – really hungry. Unfortunately we weren’t able to get any bread. All shops were closed, due to the New Year. Normally you can get a baguette on every corner (thanks to the French for bringing the art of bakery and coffee to Vietnam), but not this time. So we had to be creative. How about a cheese wrap? You take a slice of cheese, fill it with pate, salami and blue cheese. The result is a delicious and very unhealthy cheese wrap. Applied Atkins diet. Having consumed 2kg of cheese and 1kg of sausage per capita, we set of on our lovely Minsks. After two hours we reached a village where our guides informed us that the support jeep has to stay here overnight. So we took all our belongings and fastened it on the bikes. It turned out we were pretty rubbish at this simple task. Thanks God we didn’t have to set up tents, it would’ve been a disaster. 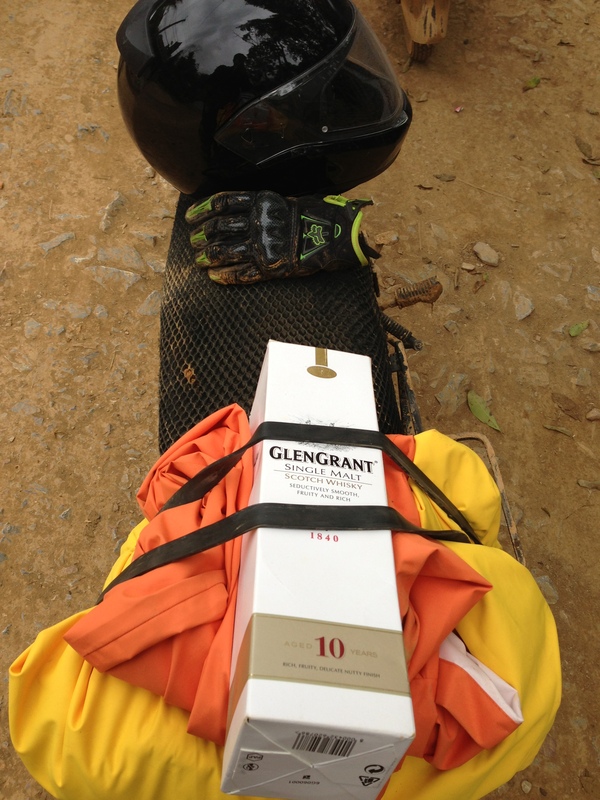 As you see, my attempts of fixing our most precious (a bottle of scotch) on the bike is just pathetic. After just 50 metres of riding the bottle shot out of the carton like a rocket from a rocket launcher, resulting in the rider behind me laughing so hard that she almost fell of her bike. We followed a road that became narrower and narrower. Five minutes in the ride, the road became a hiking trail. One of those trails where people would recommend you to wear proper hiking boots. Around half a metre to a metre wide, left side mountain, right side a steep slope down. On the trail there’s mud, gravel, slippery stones, tree roots sticking out as well as the occasional dog or cow crossing your way. I really can’t remember when I had more fun. Riding up the trail on the Minsk was a mindblowing experience! I felt like a five year old that just received all the toys he ever wanted for Christmas. While “climbing” up I was grinning like a Cheshire cat. It’s one of those biker moments where everything around you disappears. It’s just you, the bike and the road (or in this case: the trail). Nothing else is important! I had so much fun I even forgot taking photos of the trail. Before the trip I actually wanted to buy the GoPro action camera but after I gave it some thought decided against it. Big mistake! 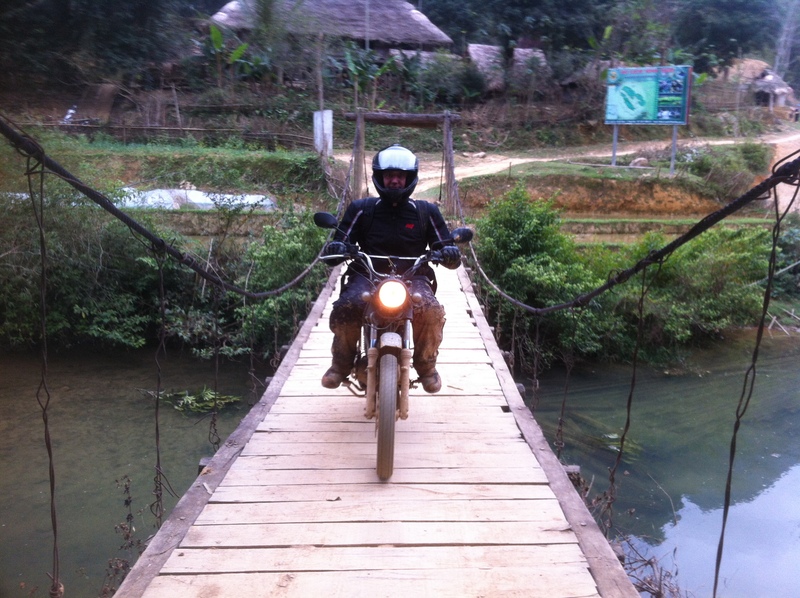 Half an hour later we arrived at our destination – a homestay in the mountains, surrounded by rice fields. Epic!